Sometimes our minds ponder the unfathomable. 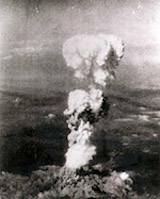 The use of atomic weapons in 1945, thought it would bring peace. All wars would end, conflicts would cease. War unfortunately is embedded in the human race. The cities of Hiroshima and Nagasaki were destroyed by the initial blast. How long did the radiation poisoning last? Has it stopped Wars?, the answer is no. Did it bring peace, no! Only God can bring everlasting peace. Governments must come together to halt conflicts and wars. Reliance and prayers to God must be our priority. Without God, there is no everlasting security. Only God holds the Key. The alternative could be the reality. Put your trust in God, not mankind. No greater love or security will you find.